While this set of symptoms may seem complicated; one veterinarian has told us that EFS looks like "nothing else". EFS is an 'exercise-induced hypertonicity disorder' meaning that there is increased muscle tone and the muscles are unable to relax. Episodes will be in response to excitement, exercise, or frustration, except in severe cases. Then symptoms may be chronic or happen with no apparent cause. Episodic Falling Syndrome displays itself as an array of symptoms so it is not easy to describe. Each dog will have it's own expression of the disorder. The frequency, type and/or severity of episodes may increase, decrease or change as the dog gets older. Therefore, there is no pattern to the progression of EFS. EFS events can range from momentary to very extended periods, depending on the dog and the degree of stress causing the symptoms. In a few rare cases, dogs have been unable to recover from an episode. A correct diagnosis is important to help alleviate the symptoms if possible. While symptoms usually arise by five months of age, first notable symptoms can occur at any age. EFS can occur in all colours and both sexes. Your dog may be screened for other disorders by your veterinarian. Some symptoms may seem similar to those of Syringomyelia, a liver shunt, epileptic seizures or other disorders. However, if EFS is suspected the DNA test is a less expensive option compared to a neurological or other workup. Please see the contact page for a link to further information on Syringomyelia and epilepsy. 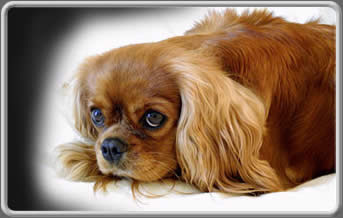 "Fly catcher's syndrome" is not known to be related to EFS but may occur in an affected Cavalier. During episodes the dog is aware, conscious and is sometimes able to react to stimuli. There is no loss of bodily function. * Chronic tenderness and stiffness may exist in extreme cases. After episodes, dogs with mild symptoms usually continue as if nothing has happened. If the episode is severe or lengthy, some panting may occur and the dog may rest and sleep. After severe episodes some puppies become frightened and take some time to calm down. Most get used to the events with age. EFS does not seem to affect temperament. Please see the FAQ page to see what to do if you think that your dog is having an episode. If your dog is having an extended episode or severe frequent episodes, contact your veterinarian immediately.